When Barbara Pigott’s husband Dave passed away in 2016, she felt profoundly numb. “I blocked out all of my feelings to get through the day. I functioned — I had to — but I wanted to block the pain,” Barbara says. The couple, who met on a commuter train, had been together for 33 years, all of them “wonderful,” according to Barbara. “Dave was very sociable, always wanted to help others and had a repertoire of jokes that could keep you laughing for hours,” Barbara says. He also was an avid golfer who enjoyed volunteering for the Sun City West Sheriff’s Posse. After her husband developed dementia, Barbara began to experience grief as she watched the man she adored slowly begin to decline mentally. Many times, she felt the urge to pull the covers over her head, stay in bed and forget about everything. But she persevered knowing that Dave would want her to keep going. 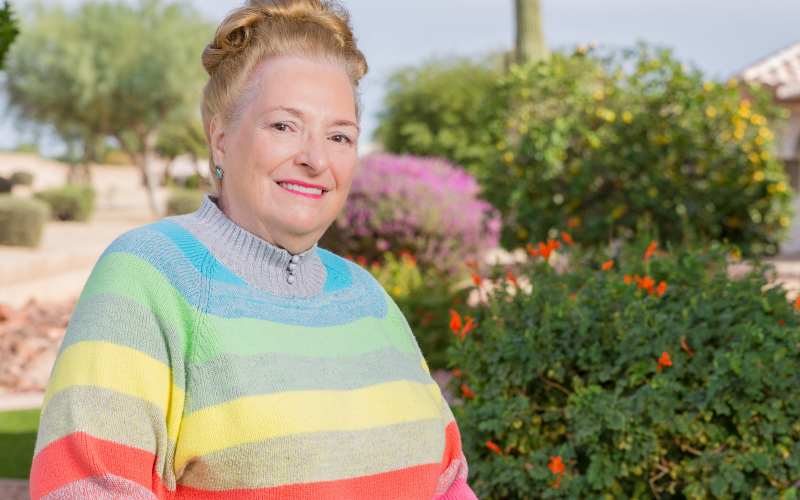 “I had put aside most of my health concerns during the 10 years I was Dave’s caregiver, and now I had to take care of myself and look to my future alone,” Barbara says. Barbara, who is a member of Sun Health at Home, says she received a great deal of help and support from Jennifer Keiser, a Wellness Coordinator for the program. “She stayed throughout Dave’s memorial service and was with me the day I collected his belongings from memory care. Her presence was a great support during those difficult times,” Barbara says. Jennifer encouraged her to attend a grief support group offered by Rev. David Klumpenhower, corporate director of Spiritual Life at Sun Health Senior Living. As a certified grief counselor, Rev. David provides members of Sun Health at Home and residents of the Sun Health communities with either one-on-one counseling or grief support groups that follow a model called the Grief Recovery Method. Barbara attended an eight-week Grief and Loss series led by Rev. David. The series helped her better understand her grief and come to terms with it. And losses aren’t limited to the death of a loved one, he says. They can occur after a divorce, the death of a pet, retirement or other situations that involve a major life change. Rev. David speaks from experience. He joined a grief support group and was surprised how much it helped him. Barbara experienced similar results from her grief support group. “We all bonded with each other and the experience was really good. Rev. David is fantastic,” she says. Barbara also has found solace in prayer, meditation, charitable giving, rosary making, healthy eating and exercise. She adopted a Norfolk terrier named Cali Rose who quickly won over her heart. Barbara encourages anyone dealing with a painful loss to seek help. “Don’t go it alone. Reach out and take advantage of all the help available. Look to Sun Health’s offerings as their seminars are a wealth of information. Also, consider Sun Health at Home. I can honestly say that they are the most caring people I’ve ever encountered, and I’m glad that I entrusted my future care to them,” Barbara says.